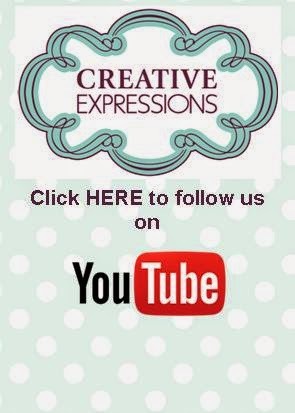 It's time to premiere Tatty Button on Create and Craft. You have seen a few sneak peeks of her on my blog, but she is ready for her close up Mr. De Mille, as they say in showbiz! I think you will find her to be a fun stamp line to play with as she suits so many styles. Notice the vintage ribbon in the corner? It's back in stock and on the show again, for all of you that have been asking me where they can get it. I dyed this one using broken china distress ink to match the card and added a coordinating yellow button. I've been in a yellow mood lately, wait til you see the rest of the samples! I just wanted to say what a lovely day I had on Sunday with the great group at Berkley Garden Centre. I had a crowd there as soon as the doors opens all the way until we ended at 3pm. I really want to thank them all for coming out and spending time with me. I don't demo very often, maybe a few times a year at most, but they made me feel right at home like we were all crafting together! It was really nice to meet some of the people that have been following my blog and leaving such amazing comments for me too. I really enjoyed that! I also forgot in my rush to put up a quick post last time to say a big thank you to Karen ( aka furry monkey) for the wonderful best friend blogger award she left for me on her blog. It now holds a place of honour on my sidebar with the few others that I have received lately. I can't tell you what that means to me to be acknowledged by your crafting friends. Thank you again. I just wanted to let everyone know that I will be demoing on Sunday the 27th at Brykley Park Garden Centre, Rangemoor, Burton On Trent. I will be there from 10 am to 4pm showing some fun techniques with embossing folders, masks, spellbinder dies, mica powders and other products that I love playing with and using. I would love for you to drop by and say hello if you are in the area! Here is another sample from last weeks shows that I really liked (and the picture came out okay too!) The flowers were made from an out of date dictionary I purchased for 25 cents in Florida while thrift store shopping with my daughter in November. I knew it would make great card embellishments and background paper! And guess what, there is my favourite vintage ribbon on there too! That stuff is so much fun to play with and use on cards. If you are coming to Ally Pally in April, I will have it at my booth and a really lovely assortment of colours too. Just a quick post so you have something new to look at and another chance to increase your odds of winning the blog candy contest! These are a couple more of the samples from the POTW shows last weekend that sold out. Thank you for all your support with those too. In my wildest, I would never have expected that outcome so quickly. So needless to say, I have over a dozen demos that I prepared that I never got to use! Hopefully they will have it on again when they are back in stock as they are truly lovely dies. If you were able to get hold of them, you will enjoy them no end. Like I said, I ran out of time long before I ran out of ideas for them. The top sample uses the lacey oval die to make a stunning rolled flower, which looks very nice when companioned with the vintage ribbon (also another sell out). Thank you for all your support today as the POTW shows today turned out to be a smashing success. So much so, that I am not certain what I have to demo with tomorrow. Tune in if you want to see me tap dance! That should be good for a laugh or two at least! They are sold out of many items, including the fleur de lis set that I had planned on using on several demos on Saturday and Sunday. I thought I would show a few of the samples (ones that I had relatively good pictures of being the criteria they were picked by!) I may be allowed to do bits and pieces of cards using some of the dies that are still in stock. I will just have to wait and see what we have left to work with by Saturday morning. I will try to get some better pics of the cards and get them up on the blog in the next few weeks though so at least you will be able to get a look at them better. The car stamps are brillant too and so easy to use. Remember Fathers Day will be upon us before we know it. Mums are so much easier to make cards for, but Dads and guys in general always require a bit more thought, don't they? Oh and by the way, after the show was over, they had me pick an email out of the cup and I picked Julie M Crane's name! Julie's name was drawn during the last candy contest too! Julie, I think with your luck, I would invest in a lottery ticket! LOL But seriously, thank you for the lovely email! They are sending out the card I demoed using the into the box technique with the Aston Martin car so do let me know when you get it. The new Spellbinders POTW shows start tomorrow at noon and later at 3pm for anyone interested to see the latest releases. I've included a pic of one of the samples that I am not demoing this weekend, but thought you might like a closer look at some of the new dies. There are six new dies on this card, two of them are part of the fun new Grand Nestie releases. It is hard to tell but this card is black and white and yellow, a combination that I rarely use, but I just love the way they layer up so beautifully to make an very simple but fun card. And yes, that is some of the yummy new vintage ribbon. It is back in stock and we will have not only the large roll of the neutral (dyeable) eggshell colour back on the show, but we will also be premiering a sampler pack of new colours. If you like what you see, grab it as the stock on the sampler pack is relatively low for a POTW item. My guess is it will sell out straight away. I am using it in a demo on the 3pm show to make a lovely vintage ribbon flower if you are interested. Candy and a card! How's that? Here is a pic of the new candy for our upcoming milestone candy contest. 1500 followers! I feel overwhelmed when I think of that! Like I said on the previous post, to enter this contest, you will receive an entry into the contest for each new comment after each new post (only one comment per post, though, will count). Let me know what you think about this candy? I loved all the comments after the last candy pic. They were great fun to read and several of them had me chuckling out loud at the images they conjured up! The card that I've posted is one of the POTW samples using our new Classic Car stamp sets which will be on the show. This one shows off three more styles of the new Spellbinder dies that are on the show. In case you are curious, the gears glued to the bottom of the card are part of the Tim Holtz Ideology range that we carry (but they are not part of the POTW shows). They are a lot of fun to use with the classic cars, though. It is so difficult to find masculine embellishments, isn't it? The title refers to the new blog candy contest and myself! I have just been told that I am doing the POTW (again!) starting next Friday the 18th on Create And Craft at noon. So I have been crafting like a mad woman in order to get enough samples for the upcoming shows as this is an all new never seen before POTW and I am starting from scratch. 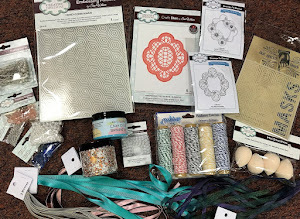 I am very excited about this one as it is covering five new Spellbinder release bundle sets and they are absolutely gorgeous! Here is one sneak peek at a sample that I've made for the show so you can decide for yourself about them. This sample shows five different dies and a couple of different sizes of two of them. What do you think? 1. I always read a book while I am walking on the treadmill (I love to read so this is how I get myself to exercise!). How's that for a lot of weird and strange facts about me! I have to admit that I think that is quite fun to make those kinds of lists. I love reading them about other people too! As the title suggests, this is just a quick post to let you know that I see that it's time for the blog candy contest draw, however, all my followers info is in my office at work. Since I am still doing shows this week and driving back and forth to Peterborough, I won't be in the office until Thursday. I didn't want anyone to think I had forgotten, but it will just be delayed a few days. In the meantime, I thought that I would give you a final chance to improve the odds of winning. If you leave me a comment after this post so that I know you have been by the blog, you will get an extra entry! The Grand Calibur Is Back!! Hi everyone! I feel like I should run around shouting, the Grand Calibur is back, the Grand Calibur is back! It has taken a couple of months to get it back in stock since the sell out launch on Create and Craft in December, but it is finally here and it is the POTW starting tomorrow. I was going to post my show times last week, but I thought that I would wait until closer to the date in case there were changes. Guess what, there were changes! I received the final dates for the upcoming POTW shows yesterday. So here goes: Friday the 4th at 12 noon and a two hour show at 3pm, Saturday the 5th at 8am and 1pm, Sunday the 6th at 4pm, Tuesday the 8th at 12 noon and Wednesday the 9th at 8am. There will be repeats shown throughout the days, but you will have to check the schedule on their website for those times. On the POTW show, we will also be featuring the Grand Nesties and their coordinating smaller sizes as well as the Ideal World Exclusive dies. 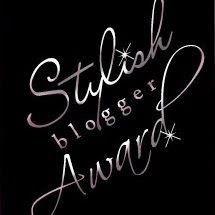 Hi everyone, Just a quick post to tell you about my first ever blog award! I am absolutely over the moon that I have been given this award. The lovely award came from Karen Bourke http://serendipitydragonfly.blogspot.com/2011/02/thank-you-so-much-to-my-good-friend.html and here is a link to her blog. 6. This is a long one so it will count as two. My grandfather (not my great grand father) was born during the American Civil War in 1853. When he was 67, he and his second wife(much younger) gave birth to my father in 1920. My father (who was one of 13 children) will be 91 on tuesday! Obviously I never met my grandfather on my Dad's side, but I always find this tidbit intriging to think about. What longevity, huh?! Okay you have it, just a few of my quirks and idiosyncrasies! I could go on, but there has to some mystery left, huh?